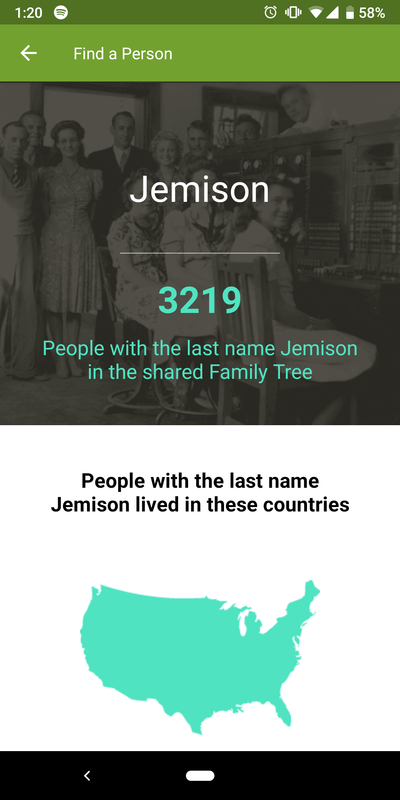 Have you tried using the Family Tree app to learn about your family or to take a family name to the temple? 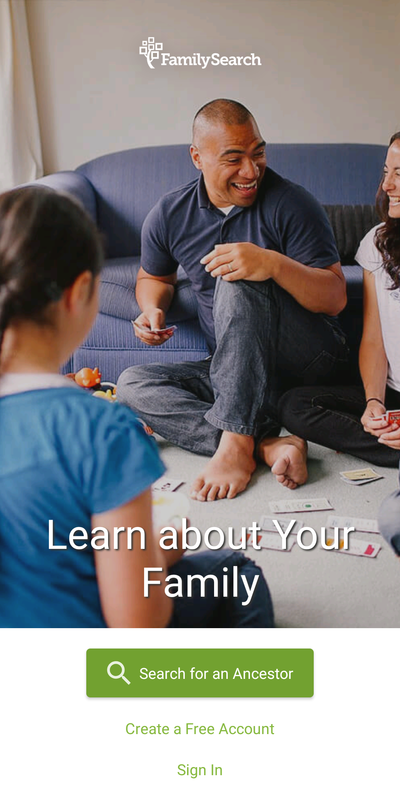 The mobile app has some features you may not have seen yet–and they give you a powerful way to connect with your family. With the Family Tree app, you can search for ancestors and learn about their life experiences wherever you happen to be–at home or on the go. You can find out if you’re related to your ministering brothers and sisters, your neighbors, ward members, and anyone with a FamilySearch tree! With so many features available to people using the FamilySearch Family Tree app, there is sure to be something that will interest people of all ages. Download the app, and give it a try! You can find it in the Apple App Store or on Google Play. If you’re having trouble finding features on the mobile app, don’t fret! Here are some quick directions for how to use each of the features we mentioned above. Ordinances Ready searches the FamilySearch Family Tree, as well as temple reservation and shared lists, to find available ordinances for people you are related to. It also does simple checks for accuracy and verifies that you have permission to perform the ordinances. To use Ordinances Ready on an iOS device, tap the temple icon at the bottom of your screen. On Android, go to the 3-bar menu, and tap Temple. From there, all you have to do is tap the green button to get started! If you do not have relatives with available ordinances, the Ordinances Ready search will expand to include ordinances that others have submitted to the temple. This allows everyone the opportunity to help those who are awaiting ordinances beyond the veil, and lets you see their name and other details in the Family Tree app. To use the Relatives around Me feature, everyone participating must sign in to the app and be within approximately 100 feet of each other. Those with an iOS device can tap on the word More at the bottom of their screen and then choose the option Relatives around Me. On an Android device, you can find the Relatives around Me tool under the 3-bar options button. 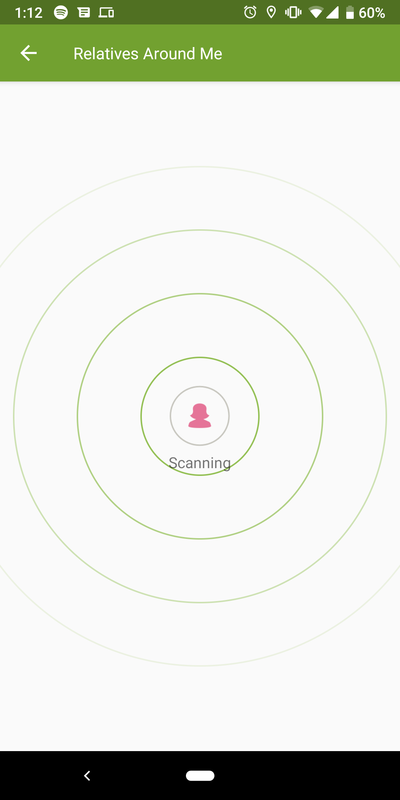 Be sure that everyone participating taps the green button to start scanning and has location services turned on for their device so the app knows you are close in proximity. Anyone using the tool within range will show up in a list on your mobile device. Selecting a person’s name will bring up a pedigree chart showing how you are related to them. You can use this tool with any number of people, whether you are with a friend, at a ward activity, or even just meeting someone for the first time. FamilySearch regularly compares your ancestors’ profile information with old and new records to see if there are any possible matches. These possible matches show up as record hints that can help you find records without filling out search forms or looking through record collections. To see these hints on an iOS device, tap Tasks at the bottom of your screen. For Android, tap the 3-bar menu, and then tap Ancestors with Tasks. This feature will show you a list of relatives. Tap on any relative that has a blue record icon to see a possible record match. The record matches shown might help you discover something new about your family or confirm information already in your tree. To find out, pick a record to explore, and tap the down arrow. You can read the record’s basic information there, or scroll down and tap the green button to compare the record to your ancestor’s profile. 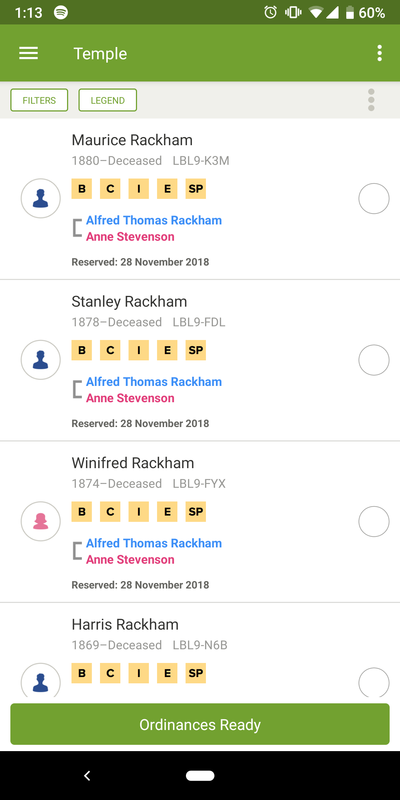 Quick tip: Have you ever wanted to use multiple screens in the Family Tree app? Now you can! Read more here. As more and more records are made available online, record hints can help you find newly added records without the hassle of repeated searching. The mobile app can help you make discoveries whenever you decide to pull out your device and take a look. Open the Family Tree app to the signed-out screen, and tap the green button that says Search for an Ancestor. Enter information about one of your relatives, and then tap Search. FamilySearch will find records, photos, and more that might match your ancestor. Even if you don’t know specific details about a relative, try putting a last name into this simple search, and see what happens! Watch your friends’ faces light up when they find more information about their family. Open the Family Tree app, sign in, and tap the search icon in the top right area of your screen. Enter at least your ancestor’s last name—the more details you add, the better! Then tap Find. This search is an easy way to learn about your family’s last name, quickly update a relative’s information, or find a relative and learn more about the family. Using this feature on the FamilySearch Family Tree app can help you have a deeper connection to family, anywhere and anytime. 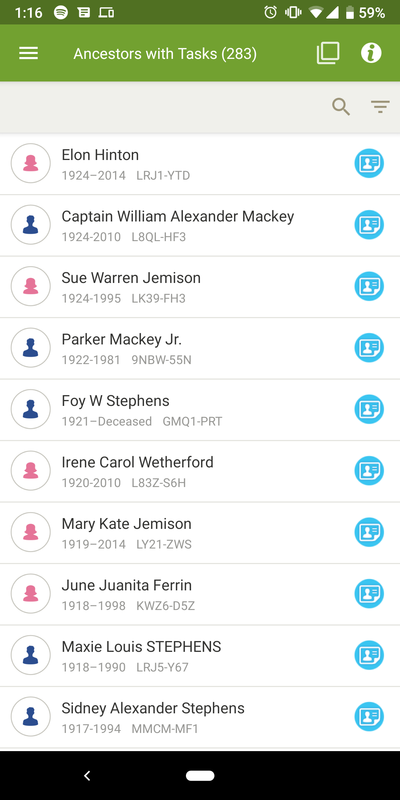 To see your ancestors’ life events on a world map, open the Family Tree app, and tap More on an iOS device or the 3-bar menu on an Android device. Then tap Map My Ancestors. 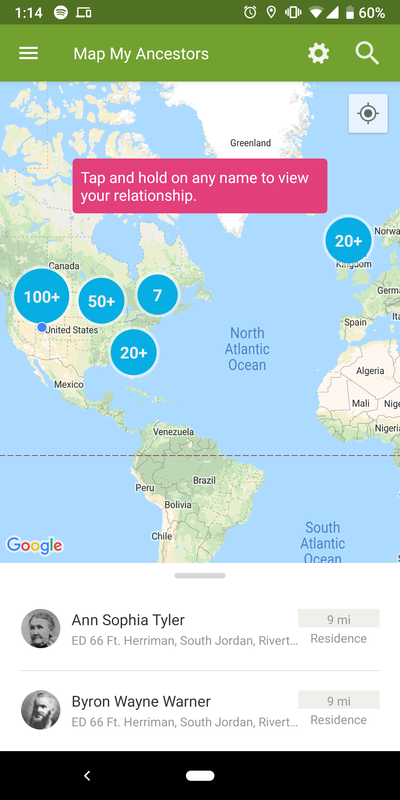 A world map will appear with blue bubbles showing numbers of events that happened in a particular location or profile images of your ancestors. Tap any of the bubbles, or use two fingers to zoom in and out, and let the fun begin!